(1928-2012) Maurice Sendak was born to immigrant parents in Brooklyn. Through most of his childhood, Sendak was often ill and confined to bed. 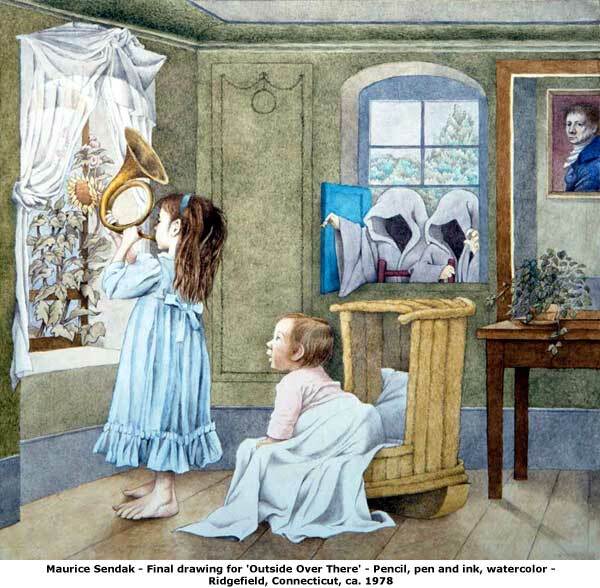 He credits this often-isolated childhood with fostering his imagination and the pastime of drawing, through which his imagination found expression. He found his way into the world of children's book illustration and soon became famous through such works as Where the Wild Things Are for the profundity, strangeness, and complexity that he brought to the world of children's literature. The drama and boldness of Sendak's work has also found an outlet in decades of acclaimed work in theatrical design. 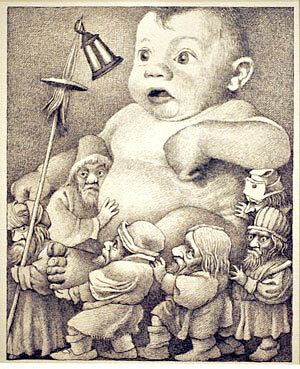 Sendak may well be considered among the greatest and most influential of our children's illustrators. My mother wouldn't let me read Where the Wild Things Are when it first came out. I was age-appropriate, but she thought it was too scary. Children tend to have their own sensibilities about these things, and we've rarely met a child who didn't like this book. Of course, Dede's grandson Alex chasing Kara the poodle with a wooden spoon has also been attributed to this book, but we all laughed about it once we figured out the source.